The change in ownership at a local establishment last summer had escaped my notice, but how happy I am to have discovered the Traditional Korean Beef Soup– 22929 Highway 99, G-1, in Edmonds. We were greeted by Bonnie Lee as soon as we walked in. Her family now operates this restaurant and she wanted to be sure we had a great experience. Hot tea was at the table before menus were opened. Tea was the traditional barley and corn, slightly sweet and refreshing. Refills came without even asking. Bonnie explained how to enjoy a traditional soup which is their specialty — Sullungtang, or ox bone soup. I chose flank steak and on Bonnie’s advice I opted for the clear rice threads — aka glass noodles — as opposed to the flour noodles. She schooled us on the process of seasoning the soup. She indicated a large dish of fresh salt, a hot sauce, and a generous bowl of chopped green onions. “Many people just order the soup and don’t understand seasoning at the last minute is what makes the flavor really come out.” Her tutelage turned the rich creamy broth into something special. Bonnie makes homemade dumplings every day. She introduced her mom who gave me a big hug. Mom taught her how to make handmade dumplings. The filling is tofu, pork and lots of greens. Bonnie brought her ingredients to a nearby table so I could photograph the process. A plate of finished dumplings. Appetizers were limited in variety, but came in generous portions. Sprouts were dressed with a sesame oil garlic and green onion. Kimchi was crisp and delicious. I’m fine with fewer appetizers when the ones presented are excellent. Rice accompanied our dishes — a blend of brown, black and Jasmine. No extra charge for rice. My husband chose Bibimbap and his assortment of vegetables and rice in the stone pot were topped with not one but two egg yolks. Delighted with the portion size, he was soon full between sips of my soup broth and the appetizer bowls, which never seemed to empty. Mackerel arrived to the table grilled perfectly. Crispy on the outside, meat moist and tender next to the bone, and a healthy treat too, packed with omega-3 fatty acids. Happy to find another great Korean restaurant in our local culinary community. Sea asparagus, a small annual herb, is also known as pickle weed, samphire greens, sea beans, glasswort and sea fennel. If you haven’t tried sea asparagus, here’s your chance to taste the unusual plant that’s growing in popularity. It’s in season for about six weeks and is sold at the Core Hero Hard Cider booth at the Edmonds Farmers Market. Recipes, market dates and hard cider store locations are available at the booth and at CoreHeroHardCider.com. Core Hero Hard Cider harvests wild sea asparagus from Lopez Island where apples are grown for the handcrafted cider made in Edmonds. Sea asparagus is salty and slightly bitter when raw. Steve recommends you soak it in water for about one hour to reduce the saltiness. After soaking, blanch in boiling water for one to two minutes and immediately submerge in ice water to stop the cooking and prevent discoloration. Sauté with reduced hard cider or with garlic and butter, and enjoy. Sea asparagus with black cod. My favorite recipe uses sea asparagus as the green accent under seared black cod. Here is the link. Also a great addition to the bowl when enjoying poke. More market dining reviews coming soon. Scratch Distillery marks their 2nd anniversary on July 10. Celebration weekend begins on Thursday, July 6 with new offerings daily until the culmination celebration on their true two-year anniversary — Monday, July 10, 2017. Hope everyone celebrates the upcoming holiday with good food and friends, but above all… safely. Have a Happy 4th! 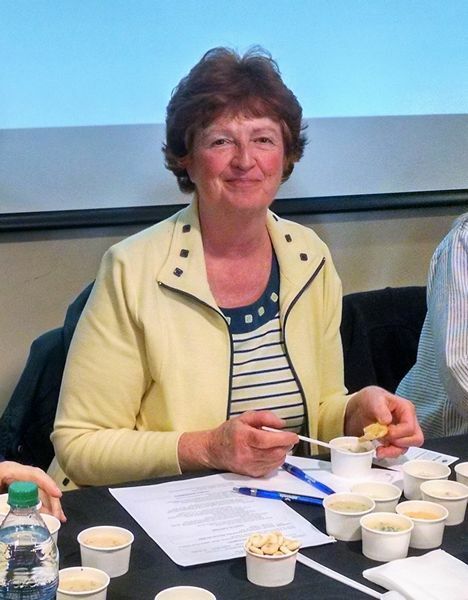 A specialty gourmet food broker for over 30 years, Kathy Passage has in-depth knowledge on food and the special qualities of ingredients used in the exquisite products she helped bring to market. Kathy brings this unique perspective from the “other side of the plate” to writing about the local food and restaurant scene.